Every year the number of participants in this intercollegiate sports and entertainment festival is on the rise, thus providing a stiff competitive quality to each of the sporting events like football, basketball, cricket, volleyball, badminton, tennis, squash, table tennis, carom, chess, kabaddi and powerlifting. Colleges from across the country in major cities like Mumbai, New Delhi, Pune, Jaipur, Hyderabad, Indore and so on, compete to be crowned Spree champions along with cash prizes. 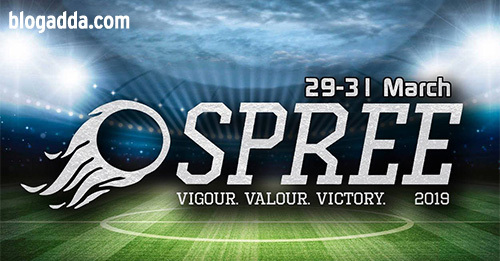 Spree has always been more than just a conventional sports fest. It continues to promote evolving sports like Ultimate Frisbee, Kho Kho, Tug of war, Gully cricket and Futsal. The “Act to Inspire” campaign, initiated in the year 2013, has Spree working with CRY for organizing blood donation camps and Clean-Up drives, in cities where pre-Spree elimination are conducted. Spree along with the NGO Nirmaan organizes Udaan, an event for specially abled children. The Spree Marathon is conducted in Panjim and is a 10km run in support of the ‘don’t drink and drive’ campaign, in association with Diego and has participants from all over Goa.